This programme is targeted for golfers with years of playing experience searching for competent and experienced golf coach to train them on how to improvise their golf swing technique to produce their optimum shot performance and special ball flight trajectories. The learning of know-how to produce a draw, fade, low and high ball shot trajectory performances to avoid obstacles commonly trees on the course green under challenging situations. This advance golf swing technique enhancement programme is for golfers who are hungry for the advance golf swing technique knowledge on how to work the golf ball. The in-depth knowledge of the dynamic posture stability, swing path, effective clubface loft angle at impact, magnus effect and ball flight’s law. The technique on how to improvise and compose your golf swing technique coupled with correct golf club selection for specialty shot making. The importance of of applying the golf mental skills to enhance your shot performance. At Asian Golf Centre, our peerless golf coach will customized the advance golf swing technique enhancement programme gearing toward a golfer area of shot making and game improvement. We will emphasize on all the important key elements to promote a well-executed shot performance. We will teach the golfer the golf sport science and psychology knowledge, physiology skills and attitude for your intended golf swing performance. Under our professional watchful eyes on your golf swing training, we will build greatness upon a golf existing foundations. This training programme also helps you to develop a positive, competitive attitude and increase self-confidence for your all golf shots making performance during your game. 1. Our attentiveness toward your golf swing execution and shot performances. 2. Our video swing analysis to help you to perfect the body movement of your golf swing execution. 3. Our demonstration of an efficient golf swing. swing technique for special ball flight production. 5. Our attentiveness to help you to achieve the lesson goal. 7. Our standard and expectation of you to be an advance golfer. This programme is design for golfer with playing experiences looking for a coach to learn the in-depth golf swing knowledge, skills and attitude. The acquisition of the key elements on how to compose their golf swing technique for various shot making performance on the golf course at competition level. Our requirement: Possess proficient golf swing technique and ready to learn how to play the golf ball on all challenging situations to become a competition golfer. 1. Participant to share with the golf coach on the his or her golf swing knowledge. 2. The strength and weakness of his or her performance. 3. The heuristic learning of his or her golf swing technique development. 4. The frequency of practices and games. 5. The objectives of signing up this training programme. This lesson equips an advance golfer the in-depth knowledge and skill for the golf swing postural stability. A advance golfer must and should know how to improvise an efficiency golf posture at different hill-slopes. The learning outcome is able setup an effective golf posture confidently. 1. You observe the golf posture for the swing technique on a up-hill and down-hill slope condition. 2. You learn the body physiology when standing on the uneven ground conditions. 3. You observe the body weight distribution when standing on the different hill-slopes. 4. 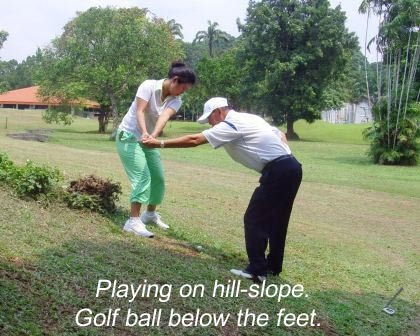 You learn how to improvise an effective 'Address Position' for a golf swing technique when playing the golf ball on a hill-side slope. 5. You learn what is 'Dynamic Postural Stability' in Bio-mechanics principle and the application for an improvised golf Address Position. 6. You learn the importance of 'Internal and External' feet rotations that has an effect to the golf swing dynamic movement. 7. You learn the importance of 'Inversion and Eversion' on the feet's movement that has an effect to the golf swing dynamic movement. 8. You learn the importance of a 'Strong, Neutral	and Weak grips' and the application for the golf swing technique intensity. 9. You learn the importance of a 'Distance, Neutral and Control grips' and the application for the golf swing technique intensity. 10. You learn the importance of the hands' 'Thenar	and Hyperthenar' muscles for holding the golf club correctly. 11. You learn the 'Advantages and disadvantages' of the '10 fingers', Overlap' and Interlock' golf grips. 12. You learn the importance of correct fingers' tensions when holding the golf club. 13. You learn the importance of the right index finger and thumb for the control of the golf club dynamic movement. 14. You learn the importance of the correct 'Arms and Hands tensions' for the starting of an effective golf swing movement. This lesson equips an advance golfer the in-depth knowledge, skill and attitude to improvise the golf arm-swing technique. A advance golfer must and should know how to perform the golf technique at different intensities. The learning outcome is able to produce an accurate low and mid trajectory golf ball flight of up to 80 meters on the uneven ground conditions. This is an essential golf swing skill for an advance golfer. 1. You observe the performance of a golf arm-swing technique at low and mid intensities on an uneven ground condition. 2. You observe learn the golf ball flight trajectory of the golf arm-swing technique in low and mid intensities. 3. You learn the application of the golf arm-swing technique performance on uneven ground condition your game. 4. You learn the role and function on each part of your body for an efficient golf arm-swing technique. 6. You learn to improvise your arms and hands movements for performing an arm-swing technique at different intensities. 11. You learn the symptom, cause and effect of excessive 'Pronation and supiration' arms dynamics movements. 12. You learn to do physical dynamic swing drills training on hitting golf balls; performing on uneven ground and with the eyes closed. This is the most important part of golf sport science's 'Advance Motor Skill Learning and Training'. 100 meters shot performance on a simulated uneven ground condition. 17. You learn what is the 'Effective loft angle' at impact on the golf ball on a simulated uneven ground condition? 18. You learn where is the most important part of the golf swing path. Why is it importance to know? 22. You learn to improvise your 'Swinging	and Hitting Styles' of your arm-swing technique for the game application. 23. You learn the 'Symptom, Cause and Effect' of your golf ball flight performances. What is a 'Push, pull, draw and fade shot'? 24. You learn the importance of focusing on the	'Process goal' in golf psychology for your composed arm-swing technique. 26. You learn to improvise the golf ball striking effectiveness by applying the NLP™ Sub-modalities. This lesson equips an advance golfer the in-depth knowledge, skill and attitude to improvise the golf full arm-swing technique. A advance golfer must and should know how to perform the golf technique at different intensities. The learning outcome is able to produce an accurate low and mid trajectory golf ball flight of up to 120 meters on the uneven ground conditions. 1. You observe the performance of a golf full-arm swing technique at low and mid intensities on an uneven ground condition. 2. You observe learn the golf ball flight trajectory of the a golf full-arm technique at low and mid intensities. 3. You learn the application of the a golf full-arm technique performance on uneven ground condition your game. your golf full-arm swing technique performance. 6. You learn the importance of body 'Lateral and Rotation' movements that can has an effect to your golf full-arm swing technique. 9. You learn the golf ball flight trajectory of a golf full-arm swing technique at different intensities. 10. You learn the important application of the golf full-arm swing technique on a simulated uneven ground condition for your game . for specialty shot making performance? 13. You learn how to improvise your correct wrists 'Flexion and Extension' movements for the golf full-arm swing technique. full-arm golf swing technique on a simulated uneven ground condition. 17. You learn the importance knowledge on 'Weight-transfer' in golf sport physiology during a golf swing action. 19. You learn the importance of focusing on the 'Process goal' in golf psychology for your golf composed full-arm swing technique. NLP™ Visual, Auditory and Kinesthetic sub-modalities. 23. You learn to improvise your golf ball striking effectiveness by applying the NLP™ Sub-modalities. golf full-arm swing technique performance. This lesson equips an advance golfer the in-depth knowledge, skill and attitude to improvise the golf iron full swing technique. A advance golfer must and should know how to: produce a slight draw and fade shots; and play the golf ball on different ball lie situations on the golf course. The learning outcome is able is able to perform the technique confidently. 1. You observe the performance of a golf iron full-swing technique on a hard ground condition. 2. You learn the golf ball flight trajectory of a golf iron full-swing technique performance on a hard ground condition. 3. You observe the performance of a golf iron full-swing technique for a fade and draw ball flight pattern. 4. You learn the golf ball flight trajectory of a fade and draw golf shot performance. 5. You learn the importance of improvising your 'Dynamic Postural Stability' to play the ball on a hard ground condition. 6. You learn how to improvise swing technique intensity to play the ball on a hard ground condition. 7. You learn the golf 'Ball Flight Laws'. 8. You learn the knowledge and cause of various golf ball flight patterns; fade, draw, slice and hook shot. 9. You learn how the clubhead swing path affect the ball launching direction at impact. 10. You learn what is 'In-to-Out' and 'Out-to-In' clubhead swing path? 11. You learn how the 'Clubface's angle' affect the ball launching direction at impact. 12. You learn what is 'Open' and 'Closed' clubface's angle at impact on the golf ball. 13. You learn how to improvise your body alignment for a golf ball 'fade' shot pattern. 14. You learn how to improvise your the clubface's angle for a golf 'fade' shot pattern. 15. You learn how to improvise your body alignment for a golf ball 'draw' shot pattern. 16. You learn how to improvise your the clubface's angle for a golf 'draw' shot pattern. 17. You learn how to improvise you 'Swinging style' and 'Hitting style' for different ball flight performances. full-swing technique. Why is it important to know? 19. You learn how train your body and mind by 'Simulation Practice' for various golf iron full-swing performances. 20. You what is 'Internal and External focus' for your composed golf iron full-swing performance? 21. You learn the NLP™ SCORE Model for your 'Detection and Correction' of your golf swing and golf ball flight performances. iron full-swing swing technique performance. 23. You learn how to improvise your golf ball striking effectiveness by applying the NLP™ Sub-modalities. This lesson equips an advance golfer the in-depth knowledge, skill and attitude to improvise the golf fairway-wood swing technique. An advance golfer must and should know how to improvise the technique performance to play the golf ball on an uneven fairway ground situation. The learning outcome is able to perform the technique confidently. 3. You learn the importance application of the golf fairway-wood swing technique' intensities for your game. fairway-wood swing technique at mid and high intensities on a simulated uneven ground condition. 5. You learn how to improvise of correct finish-swing posture - 'Extension and Hyperextension' movement of the body. 7. You learn how to improvise your the 'Tempo, Rhythm and Timing' for the golf fairway-wood swing technique performance. swing technique at mid and high intensities on a simulated uneven ground condition. 9. You learn the 'Cause and Effect' of incorrect body setup for a golf fairway-wood swing technique performance. 11. You learn the most important dynamic impact zone of the golf fairway-wood swing action. 12. You learn what is the 'In-to-Out' and 'Out-to-In' of the golf fairway-wood swing paths. and the 'Correct Breathing Method' for golf fairway-wood swing technique performance. fairway-wood swing technique. Why is it important to know? composed golf fairway-wood swing shot performance. composed golf fairway-wood swing technique. 23. You learn to compose your golf ball striking effectiveness by applying the NLP™ Sub-modalities. golf fairway-wood swing technique performance. This equips an advance golfer the in-depth knowledge, skill and attitude to improvise the golf driver full swing technique. A advance golfer must and should know how to improvise the technique at optimum intensity through out the game. The learning outcome is able to drive the golf ball to a targeted position on the fairway confidently. 1. You observe the performance of a golf driver swing technique in mid and high intensities. 2. You learn the golf ball flight trajectory of a golf driver swing technique at mid and high intensities. 3. You learn the importance application of the golf driver swing technique' intensities for your game. 5. You learn how to improvise your 'Dynamic Postural Stability' in Bio-mechanics and the application for the golf driver swing technique. 6. You learn the 'Cause and Effect' of incorrect body setup for a golf driver swing technique performance. and 'Follow-through' in sport science principles for the golf driver swing technique. 8. You learn the most important dynamic impact zone of the golf driver swing action. 9. You learn what is the 'In-to-Out' and 'Out-to-In' of the golf driver swing paths. 11. You learn how to improvise of correct finish-swing posture - 'Hyperextension' movement of the body. follow-through and finish-swing within your physical and athletic ability. 13. You learn how to improvise your the 'Tempo, Rhythm and Timing' for the golf driver swing technique performance. swing technique at optimum intensity. during the swing action at optimum intensity. and the 'Correct Breathing Method' for golf driver swing technique performance. driver swing technique. Why is it important to know? 23. You learn the 'Internal and External focus' for your composed golf driver swing performance. 25. You learn to master your golf ball striking effectiveness by applying the NLP™ Sub-modalities. golf driver swing technique performance. 1. Practice diligently to see your self-actualisation of your advance golf swing technique. 2. Practice your golf swing movement patterns within 3 days to maintain the golf technique mastery according to sport science principles. advance swing technique under our professional teaching guidance, supervision, assistance, motivation and feedback. The Advance Golfer 6 lessons Swing Technique Enhancement Programme. 3 sessions. Each session is 1.5 hours. complete the three (3) golf sessions in 3 consecutive weekdays. Each golf session by appointment only. The programme is to be completed within 6 weeks. Participant is required to book lesson in advance. The purchase is by Cash Card from the ball dispenser machine. $900.00 per training programme for one-to-one personal coaching. Call us for Group Advance Golfer Swing Enhancement Technique Training Programme fee. Advance full programme fee payment in cash, cheque or Internet Banking transfer only. your golf shot performance. See yourself as an advance player.